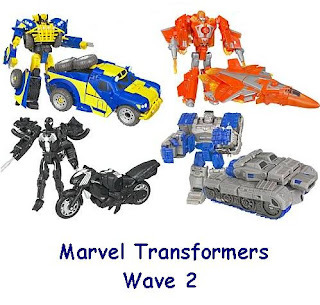 The second wave of the Marvel Transformers are out now, featuring Wolverine (Jeep), Human Torch (Jet), Spiderman in black costume (Motorcycle) and Grey Hulk (Tank). Looking back at Wave 1, you can see that two of these are repaints (Hulk & Spidey) while Wolverine and the Human Torch are new molds. They retail for $14.99 each.